She’s so fine, she’s in my mind. “It’s a black & white flicker. 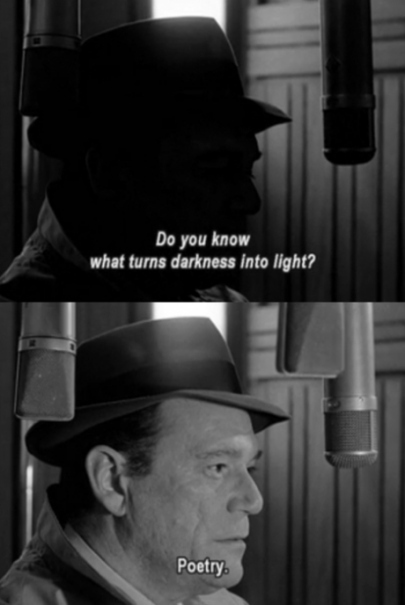 ‘I walked With A Zombie’, and ‘The Third Man’. I heard a ways back/that the actor Peter Sellers/stormed off a set/(a clunker cliche’/”stormed” as a verb)/That Sellers acted up, disturbed/by all that was wrong when a man in the crew/wore green and purple. juju mon/ Radiohead/ Could carry me dead on. To fill skies w/ gloom jam jabbed in. They can kill a guy. (The ones you stood up against. Too often, too fierce to soften & go. To get down One P.O.V. French for “Too much of a good thing”, Oui?